Originally from Nebraska but now living in Salt Lake City, Utah, David has been performing in various musical acts since the age of 17. From rock, blues, country, progressive, and guitar orchestra pit, he’s covered it all, and has shared the stage with such notable names as Beach Boys, Chicago, Peter Noone & Herman’s Hermits, Young Rascals, Glen Campbell, America, Kansas, Styx, Peter Frampton, Hall & Oates, Hootie & the Blowfish, John Waite, Big Bad Voodoo Daddy, and the Temptations. But David’s main musical love captured his attention when The Beatles performed in America for the first time on the Ed Sullivan show. Inspired by what he saw and heard, David focused on singing and playing guitar and feels privileged to portray the “quiet, spiritual” one in the group. 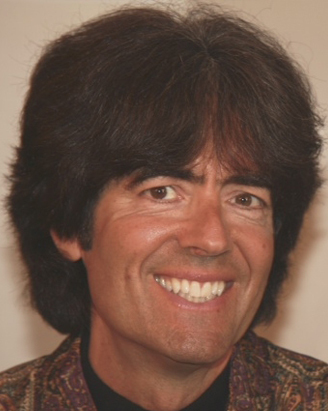 Since 1993 he has taken the stage with a variety of Beatle tribute bands, but especially enjoys teaming up with a full orchestra to authentically reproduce the original recordings in a live concert setting. David loves to present George’s guitar arrangements in their articulate detail.